Joe Dante's film resume veers from terrifying horror through slapstick humour to charming kids tales. It has to be said that I admire Mr. Joe Dante – in a business heavily influenced by trends and fads - throughout his varied career he has stayed true to his own voice – making films that don’t pander to mainstream obviousness, whilst never afraid to explore new mediums or technology. This gives his films a real independent feel about them. He even turned down directing Batman back in the 80s, a gig that most would give their right arm for, because he didn't feel he was right for it. His latest, The Hole is no exception and stays true to his ethos - including the welcome addition of Dante having shot The Hole in 3D. A Roger Corman alumnus Joe Dante crashed the party with Piranha in 1978 I must of seen Piranha in my mid teens and loved the terror of the B Movie Jaws rip off. It wasn’t going to win any Oscars but it was damn fun. Over the years to come Dante went on to bigger and better things. 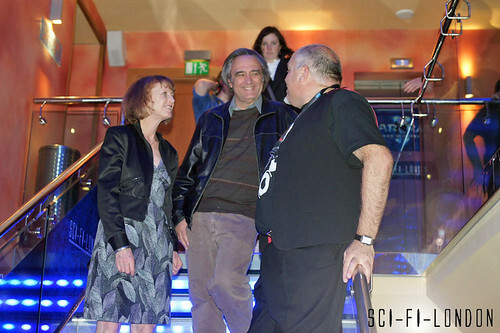 Mr. Joe Dante chatting with Sci-Fi Festival Head Louis Savy at Sci-Fi London 9 : Opening Night, originally uploaded by Craig Grobler. Although Dante hasn't made a big screen film since 2003 he has a staggering output across film and TV including kids favorites; Gremlins (handpicked by Spielberg to direct), Explorers, Innerspace, Gremlins 2: The New Batch, Small Soldiers, Looney Tunes: Back in Action. Terrifying horror like Piranha, The Howling (a werewolves back when they weren’t as cool or mainstream as today), The Twilight Zone, interspersed with slapstick like; the hilarious Police Squad! (TV forerunner to The Naked Gun films), Amazon Women on the Moon and many great TV shows like his cult favourite Eerie, Indiana, CSI: NY , The Twilight Zone, Amazing Stories, Night Visions and a personal favourite the chilling Masters of Horror series. A recurring theme running through his body of work is a childhood rites of passage with a supernatural or science fiction twist to them. And The Hole 3D continues this with its supernatural slant. Squarely aimed at a younger audience The Hole 3D starts with a young family of three moving into a new home in the suburbs. We are introduced to the youngest, wisecracking Lucas (Nathan Gamble), Dane the older brother on the verge of adolescence and Mom Teri (Teri Polo). Pretty soon we work out that Dane is not happy about leaving the big city behind or pretty much everything else. Except his new neighbor Julie (Haley Bennett). Pretty soon we are getting to know the family a little better – this is not their first move, getting a guided tour of small town USA and discovering that their new house has a mysterious bottomless Hole in the basement. Initially the hole is locked down but after their first exploratory visit they leave it open letting loose something supernatural. The remainder of the film is about the kids having to understand what has escaped The Hole and face their own personal demons. I was hoping that The Hole would have echoes of Dante’s interesting adult works like The Howling or Piranha but The Hole is squarely aimed at a younger audience - it's more like the off the wall, but completely charming The Explorers by way of Stephen King. It plays in a territory that Dante is a master of - a film about kids made for kids. After The Hole starts playing it’s tricks on the kids it plays out almost like three different stories with each of the kids on their own personal journey much like an episodes of one of Dante’s TV shows. This allows Dante to create different tales each with its own flavour, atmosphere and level of surrealism and. Dante is a master of building tension so each story gets it’s own creepiness. As The Hole is aimed at a much younger audience than me, much of the denouement was a little lost on me but there were certain elements early on that creeped me out particularly Julie’s story, reminiscent of The Ring. I can only imagine how awesome mad scientist Bruce Dern's light display and the climax of The Hole must have looked in 3D. Also keep an eye out for Dante stalwart George Miller's cameo. It does seem that a lot of the new 3D films are allowing directors to get to grips with the 3D process and I hope to see another Joe Dante 3D film soon for adults. The Hole will be available on DVD and Blu-ray on 17th January 2011.